A perfect card game for video gamers, Le Neckbeard is a wonderfully self-aware and hilariously NSFW game that celebrates (and skewers) the social awkwardness of the gaming crowd. Your goal is to save some beautiful Waifus (from Japanese body pillows and booby mouse pads to the killer high school girl from Yandere Simulator) from the greasy hands of your rivals. Along the way, your neckbeard will have to summon sodas and deal with dreaded real-life responsibilities, like doing the laundry or talking to your actual girlfriend. If your group can take a little good-natured self-criticism, they'll love this tongue-in-cheek game. 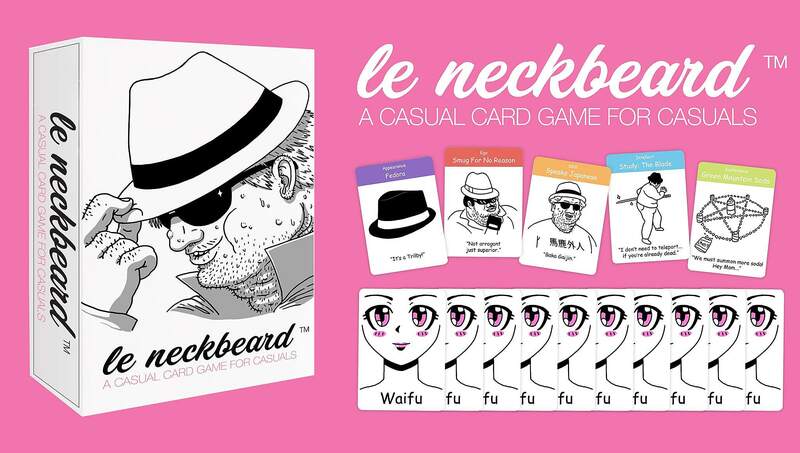 Le Neckbeard was originally only available for Kickstarter backers, but a limited run of new decks is now up at the Jason Anarchy Games site.